At 90 knots airspeed and wings level, the airplane struck the top of a 55 foot tall hickory tree approximately 3,960 feet from the departure end of runway 14 and struck a trailer roof, trees, a small pickup truck, and power lines before coming to rest upright in a residential front yard 337 feet from the initial impact point. The cockpit area and main fuselage burnt out. PROBABLE CAUSE: "The flight instructors failure to use the single engine best angle of climb airspeed resulting in a loss of control of the aircraft. 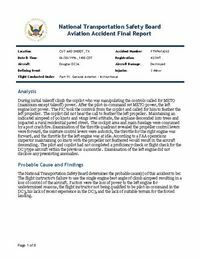 Factors were the loss of power to the left engine for undetermined reasons, the flight instructor not being qualified to be pilot in-command in the DC-3, his lack of recent experience in the DC-3, and the lack of suitable terrain for the forced landing."